Every year, the Hahnenkamm Races draw fans from all over the world to Kitzbühel. Every spectator has their own special bond with the legendary skiing event. Dana Mackenzie’s story shows just how special this connection can be. In the end, Mackenzie’s professional skiing career was not to be, but his coach had planted the seed which would grow into a passion for the Streif. He told the young skier of his victories, the challenging course and its legendary sections. Mackenzie was fascinated from the word go. Later in life, Mackenzie met his wife, also a sports fanatic, and together they would follow the Hahnenkamm Races year after year. This race and its course setting are both based on the actual Streif. “It’s great because we have the turns all named in the course, like Steilhang, Compression and so on”, explains Mackenzie. The piste is a 470-metre vertical drop, each run roughly a minute long. “It’s the steepest vertical drop in North America,“ he laughs. Every year, racers compete for the title of King and Queen of the Hill. It obviously can’t keep up with the Streif, though: “The original track is just so intense. The racers give everything they have and go for the full risk,“ Mackenzie enthuses, eyes gleaming. 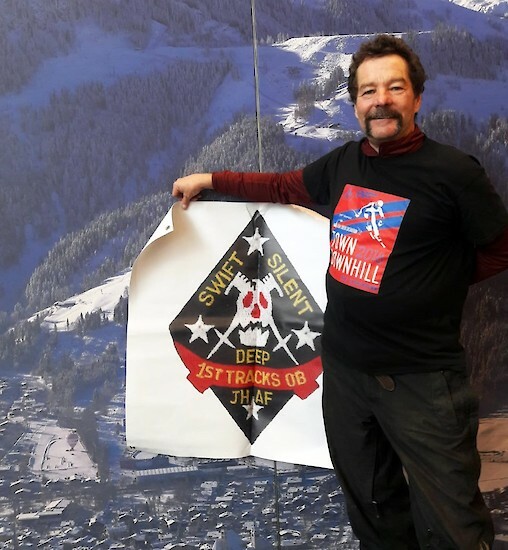 I feel the incredible energy when the athletes race down the Streif.“ Strangely enough, the American has only been able to experience these feelings via the TV until now – Mackenzie is visiting the Hahnenkamm Races in person for the first time this year. “We have never been to Europe before. We couldn’t afford it while we were raising our three children,“ said the 61 year-old. That, however, is no longer the case: Mackenzie and his wife were able to join the Jackson Hole Airforce freeride group and his friend, Kyle Watson, on their annual organised trip to the ski races in Kitzbühel and Schladming. They arrived at the Hahnenkamm the day before the Downhill. he said happily. After the Downhill on Friday and the Slalom on Saturday, I'll watch the Super-G today. The trained bricklayer was also able to celebrate the 79th Hahnenkamm Races together with the USA ski team yesterday in a private party. "We are just grateful that we are here", said the American on behalf of himself and his wife. Dana Mackenzie and the Hahnenkamm Races – a very special love story.